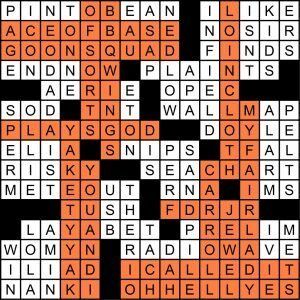 This is pretty much what I think a freestyle crossword should look like in 2018. I’ve highlighted the entries in the grid I considered to be either marquee or at least very good, ‘marquee’ being the ones where your synapses fire like crazy as you’re filling in its letters. I know you can read but I’ll just type them out so they can be Googled later, plus to emphasize the point that a dozen or more of these is really what makes a themeless puzzle. Once you forgo a theme, you have an obligation for the grid to be full of outstanding entries, like this one: GOON SQUAD, I CALLED IT, MY FAIR LADY, YAKETY YAK, FDRJR, PLAYS GOD, JEWEL, OF SORTS, CARROLL, LOINCLOTH, OH HELL YES, and of course the great BBQ WINGS camouflaged nicely in the middle somewhere, lurking like a crocodile, unlike the old days when we would’ve stuck this at 1-Across because that’s what you did. Let’s give it the worst-five-entries test to see the price paid for all that good stuff: DAH, IVIE, TFAL, ELIA, APA. That’s not awful, so certainly worth it I’d say. I didn’t cringe at all during my solve, which was: put ACE OF BASE in at 15a. [Pop group with the 1993 #2 hit “All That She Wants”] then 17d. [Tough crowd?] GOON SQUAD tumbled and off to the races. Then a gradual downward-and-rightward cascade of words filled in as is typical. ***Took a good 30 seconds to understand the clue to INFIELD at 10d. [First, second and third place]. Was this a horse-racing reference? Is “place” a typo for “base,” which wouldn’t make sense anyway? Then the a-ha moment — it’s just “place where you’d find first, second, and third (bases).” Sneaky. ***27: [This blows!] = TNT, SPERM 25d. [Certain bank deposit], and OH HELL YES 65a. [“Abso-freakin’-lutely!”]. 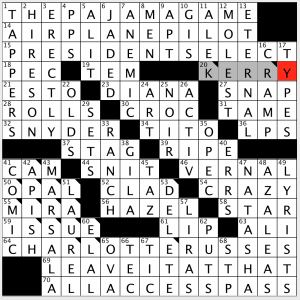 This is not your grandmother’s NYT crossword! Or maybe it is, I don’t know your grandma. ***Apt final entry to note: ENDNOW 19a. [Program-closing command on a PC]. I thought this was great, but I unfortunately haven’t been solving as many themelesses as I’d’ve liked over the past few years. Are they all this good now? Scary if so. 4.35 stars. Ironically, the title reveals the secret of the theme at first glance. -IC is added to key words in certain phrases. 23a [Boxy reconnoitering drone?] CUBIC SCOUT. 25a [Snacks designed to alleviate attacks of anxiety?] PANIC CAKES. Slight inconsistency in that “pancake” is one word. 44a [Oddly funny group of settlers?] ANTIC COLONY. This is where things start to get wonky. I didn’t feel this entry had any surface sense. 66a [Cloth screen that comes down when the play starts?] IRONIC CURTAIN. Same with this one. IRONIC CHEF would make a better entry, though it wouldn’t fit in this space. 85a [Designer of megaphones and dunce caps?] CONIC ARTIST. I do like this one. 92a [Bozo?] CLASSIC CLOWN. And this one. 109a [Lakefront dwelling inhabited by Vulcans?] LOGIC CABIN. I’m okay with this, but the clue feels off. Not all cabins are lakefront. How about [What Spock named his vacation home?]? 112a [Bit of baling twine used to hold up one’s britches?] RUSTIC BELT. This works. On the whole, I didn’t get many thrills out of this add-some-letters theme. There’s nothing really new here and the chuckle-meter barely twitched. Maybe it was also due to some of the rough fill. Let’s see, there’s LACE INTO [Attack], LAID IN [Saved for the future], SLATY [Bluish-gray], DAYAN [Meir’s minister of defense], POPPA [Old man], and KRAALS [South African villages]. That’s a lot of unpleasantness to have to swallow. There are good things to be sure: CANADIENS, CHALICE, GUNRACK, BON JOVI, OUR TOWN, PLACE A BET, ARCHAIC, CROSS-TIE, ANOMALIES, GUSTATIVE, ASPHALT, LOCKNUT, and PULSAR. That’s more than I remembered during the solve since I felt like I was just slogging my way through. Oh, did you notice ETRE [Start of le monologue d’Hamlet] crossing NOT TO BE [Doomed from the start]? Odd that they weren’t cross-referenced. My faves: 21a [American assignment] for SEAT, 115a [It may be brought to order] for MENU, and 121a [Stocking merchandise] for TOYS. 28a [Catch up]. ENMESH. As in, “to get caught up in.” Tough one, especially since it’s crossing both LACE INTO and SLATY. This standard theme only works part of the time and the rough fill in the grid overshadowed the nicer parts. 2.9 stars. These two always make fun puzzles, and this one is no exception. I count 70 words, and if the G at 43A was instead an F, this puzzle would be pangrammatic. I know that is usually not a goal, but I wonder if the constructors realized that? Tons of fun stuff in here, and I may have learned a new tidbit or two, which is always welcome! 4.5 stars for this one! 1A [Knot remover] NECK RUB – Oh, THAT kind of knot. I think I need a neck rub right now! 18A [One pulling his weight around Christmas] BLITZEN – This took me a minute to figure out, probably because it isn’t December! 53A [Brewery sugar] MALTOSE – Beer has sugar??!! 4D [Nocturnal Asian snake] KRAIT – This is a rare breed of snake that I don’t encounter too often in puzzles. Or in real life for that matter. But I’ve also never been to Asia! 5D [Singer ranked #10 on Rolling Stone’s list of the 100 Greatest Artists of All Time] RAY CHARLES – This clue went a loooong way to get to this guy. The clue is tantalizing, since you KNOW it is a mega-famous person. 12D [Party bites from the toaster oven] PIZZA ROLLS – I’m lazy: I go the microwave route. I ate TONS of these growing up. 30D [Campers anchors] TENT STAKES – I lost a little time because I had SPIKES in here instead. 32D [Speakeasy circulator] B-GIRL – Great entry. Don’t see this too often, either. I think this term was thrown around a little in the 80s in rap lingo. I think. I could be wrong! That is all. Another LAT write-up coming from me on Tuesday. I thought I was going to jam through this one like I did before, but I got mired down in a corner, and I will try to explain why in the comments below. If you take one look at the error marks in the grid image, you can easily tell where I had my … issues. There are some nice stacks going on here, but the middle played a little easy with all the shorter words. If I hadn’t done what I did, I might have had a quicker time. But for a Stumper, I am still happy with a sub-15 minute time. Which probably means look out next week! 4.2 stars today. 1A [Musical set at the Sleep-Tite factory] THE PAJAMA GAME – Great clue. Although I have only vaguely heard of this play. But remember: I am quite uncultured. 14A [Travolta, avocationally] AIRPLANE PILOT – I think it is quite well known that he is an accomplished pilot. The hard part, perhaps for some, is knowing what an “avocation” is! 23A [Secret identity of “The Amazing Amazon”] DIANA – Fairly sure this is a Wonder Woman reference. 32A [“Justice League” director] SNYDER – A tie-in to 23A! Zack Snyder was the director of 300 and Sucker Punch, two films that are quite striking in how they were shot. he is also involved in the upcoming Aquaman movie. It’s the comics movies that make the money! 55A [Third Best Supporting Actress Oscar winner directed by Woody] MIRA – This was my big mistake. I had CATE in here, but here Oscar for Blue Jasmine was a Best Actress award, not Best Supporting Actress. Whoops! I think this was my fatal mistake. Mira Sorvino won for Mighty Aphrodite in 1995; I didn’t look up the other two winners. 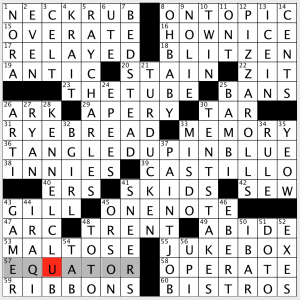 61A [“The Louisville __” (63 Across)] LIP – See next clue. 63A [“His hands can’t hit what his eyes can’t see” speaker] ALI – Great tie-in! Nice that they are consecutive clues and done in a fresh way. Nothing overly complicated, but I found this one of my favorite parts of the puzzle. 11D [Slavic alternative to Xander] ALEK – Alexander, get it? Yeah, it took me a while too. Yes, there is another error mark in this entry! 45D [“Devil May Hare” antagonist] TAZ – Bugs! This entry was posted in Daily Puzzles and tagged Doug Peterson, Harold Jones, Lester Ruff, Mike Shenk, Patti Varol, Sam Ezersky. Bookmark the permalink. A good, tough Saturday puzzle. Never heard of Ace of Base or T-Fal cookware . Had vague remembrances of Womyn spelling and FDRJR. Another self-serving entry from the WSJ editor. that are much better than some of his constructions. Whoa. I have been watching the Mike Shenk Debate for a while, and I want to say that I am pro-Mike Shenk. His puzzles are consistently good, with lively entries and some really fun clues, and I feel that he has his own reasons for having to use them. I don’t know all the circumstances behind which constructors are accepted and published, and how many submissions he receives. I am just glad that I get to do the puzzle at all. Mike’s one of the Crossword Jesuses, according to Brendan Emmett Quigley. Along with Frank Longo and Patrick Berry. Critic, by “submissions that are much better,” I take it you mean your own since you seem to have some insight into his reviewing and editing process. This sounds like sour grapes, and whether that’s a fair assessment or not, it’s exactly the kind of criticism you just leveled at Mike Shenk. We don’t know how many puzzles he gets sent or how many he accepts or rejects, and we certainly don’t know their quality. The only thing we have to go on is the latest communication from the WSJ a few weeks ago. The gist of it was that Mike would rather not have to run his own puzzles, but when there is a shortage of quality submissions, he will. Whether his reviewing standards are too high or too different from yours or mine, that’s impossible to say. You may not agree with his decisions, but calling them “self-serving” is a judgment made without all the facts. He alone is the arbiter of what’s right for the WSJ puzzle brand. He’s got to take into account the entirety of the WSJ solvership, not just other constructors and not just solvers who comment in online forums. Maybe your grids really were high enough quality, but maybe there was some other reason they couldn’t be used. I don’t know. I have had some grids accepted by him and some rejected. And yes, rejection still stinks, but rather than fume, I try to give the editor the benefit of the doubt and accept that decision. There are always other venues, and another idea will come along soon. I think if you’re going to criticize someone who’s been in the crossword business for decades, you should at least have the guts to sign your name. IMO Mike and the rest of the WSJ crew are very professional, timely, and all around excellent to work with. Also very willing to work with you on a concept that needs polishing. 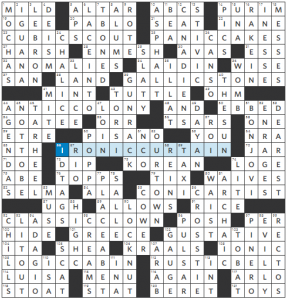 The WSJ pays half the price of the NYT for a weekend puzzle. The NYT has only a handful of accepted 21x21s. WSJ probably has even less. I’m not surprised he has to make a lot of the Saturday puzzles. I’ve been in the party that finds WSJ puzzles poorer than they should be (and while the comments here almost uniformly disagree, the ratings on this site do not support that view), and I would also hope that a greater diversity of setters compared to so much of the editor’s own would help a great deal. It’d also deal with Amy’s objection to his female pseudonyms. Tough NYT. I had to look up RIO at the end to finish. THE RIO is unidentified slang, as is TACH right next to it. PERF is identified, although it’s doubtful any self-respecting teen has used it unironically in a decade. Still have no idea what the clue for WIN is about. But hey, there’s YAKETY YAK & a band that failed to top the charts 25 years ago, so it’s a great puzzle. Apparently. A team’s record is written as “number-number” so “1-9” would be 1 win and 9 losses. A tough entry, especially when it’s crossed by the “WOMYN” and “NANKI” trivia. OK but, I mean, 1-9 doesn’t mean anything. If it had a recognizable format, like 71-91 (or whatever) for a 162-game baseball season, or 6-10 for a 16-game football season, sure. But this is just, you know, there. It’s also purposely misleading in that “1-9” suggests an order. I had JAN at first, thinking it was a date. I wonder if it had to be 1 since WIN is singular? Not my kind of NYT at all (maybe just because I am old). The NW was hardest for me — ACEOFBASE eventually appeared because I’ve seen the name, not because I know any of their songs. GOONSQUAD I know only because of the novel with that word in the title, so the clue here wasn’t much help. ICALLEDIT and OHHELLYES are fine, but having one on top of the other was difficult (neither phrase is in my vocabulary). Ditto for PERF, but it was guessable. Plus lots of proper names: NEDLOW, THERIO, DOYLE, oddly spelled IVIE, LOLA, FDRJR, CARROLL, AMIN. Some I knew, some I didn’t, but they made the puzzle a struggle in places. It says something about me, I guess, that one of the first answers I plunked in was NANKI. Derek: What language is that, in the Bugs Bunny cartoon? I can detect the faint English underneath the dubbed language that sounds Slavic to me. Interesting! I don’t think that was the entire cartoon, but it was fun. Thanks for sharing. Ha! Good ol’ YouTube. I saw the vid of what I wanted and didn’t even notice the voiceover! I have no idea what language that is! There is nothing at all wrong with the Dylan original; it’s definitive and one of the best songs in his entire catalog. Many thought Dylan was dead at that point in his career and than he came out with that album which was a masterpiece. Remember it like it was yesterday. Pannonica has it right as usual. And “Blood on the Tracks” is an absolutely awesome album. Among poker players, THE RIO is universally known as just that. I am not sure if it is the biggest casino, but it is absolutely gigantic. Trivia: Our son is a producer of the WSOP and practically lives at The Rio part time, and edits the show in L.A. where he lives. He reports that the largest casinos are MGM, Bellagio and Caesars, but he doesn’t know which is THE largest. MGM Las Vegas is the largest hotel in the world, however. I have been in most of the casinos in Vegas at one time or other. Here is a link saying the Venetian has the most floor space as opposed to most rooms. I am shocked to learn that The Rio is not even in the top 10 as it definitely seems to be the biggest to me. I wonder if some of them have multiple stories of floor space. It’s been a while since we’ve had such a tough nut on a Saturday. It looked like a DNF for a minute. I remember all Saturdays being tough, at one time. Maybe I’m just getting better at them. There was a time I wouldn’t even look at them. I’m not sure I enjoyed this one, although looking over the completed grid, it was a pretty good solve. SAND_PILE doesn’t seem quite right. I’ve played in sand piles, but they weren’t in sand boxes. Hardest Saturday NYT in memory (due in no small part to the trivia and it’s placement), easiest Stumper I’ve ever done, nice LAT. The Stumper’s my favorite puzzle of the week (thanks Stan and crew!) but, unfortunately, the new subscription fee will probably be a deal breaker. Look, I have no problem with puzzles that make you work for it. After all, it’s Saturday. What I do have a problem with are puzzles that are just guessing games without prior knowledge. Like, how on Earth am I supposed to get started there? Same with LOINCLOTH, crossed by three proper nouns and two interjections. The East was hell for me. Judging by his tweets, Sam Ezersky (whom I like very much) wanted to make this one especially difficult. Again, fair game. But this one was a borderline Kevin G. Der puzzle. Thank gods the proper nouns were at least a little bit familiar, so I didn’t break my computer screen out of frustration. I was firing on all cylinders last evening, so finished both the NYT and Stumper. After sussing the WSJ contest meta! When I came to the blog, I saw the high ratings for the LAT and printed it too. LAT: Like the symmetrically placed OVER ATE and OPERATE. As far as today’s music, I knew the Dylan song from my life, and ACEOFBASE from my son’s early favorites. Ace of Base are racist. Having them right on top of ‘good squad’ is gross. NYT a killer for sure. I’m surprised I finished. Much I didn’t know, like the casino and the pirate. I’ve seen T-fall only in a puzzle and took all crossings to recall it. Mostly fair, although i hesitated to try IVIE as a name and never did understand WIN. A leading critic coined the handle Neo-Dada back then, but have to say it never really caught on. She applied it to an oddly diverse set of artists anyway. WSJ A66: The curtain is ironic because it is coming down at the beginning of the play rather than the end. I missed the joke (as the reviewer seems to) but my theatrical spouse laughed out loud as he filled it in…then kindly explained it to me.